They have huddled together in their makeshift camp through rain, snow and even typhoons – occupying government-claimed land and defying authorities with their art, protest songs, candlelit vigils and handmade signs. This particular occupy movement had been in the making for four years before the worldwide wave of 2011. Indeed, it was only a few months ago that no more than a handful of people outside of South Korea had caught wind of what was taking place in Gangjeong village. 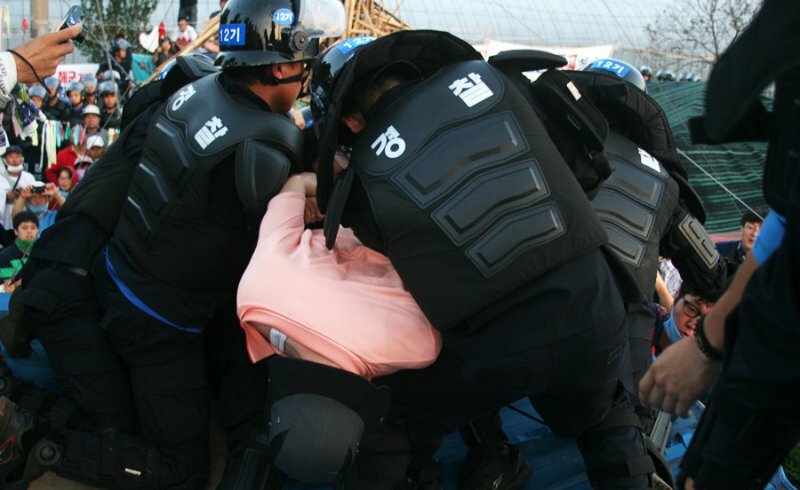 On September 2nd 2011 the occupation of the Gangjeong military base construction site ended – the result of a brutal crackdown by nearly two thousand riot police. More than 35 people were arrested that day. Some were just released this past week after being held without bail for weeks. 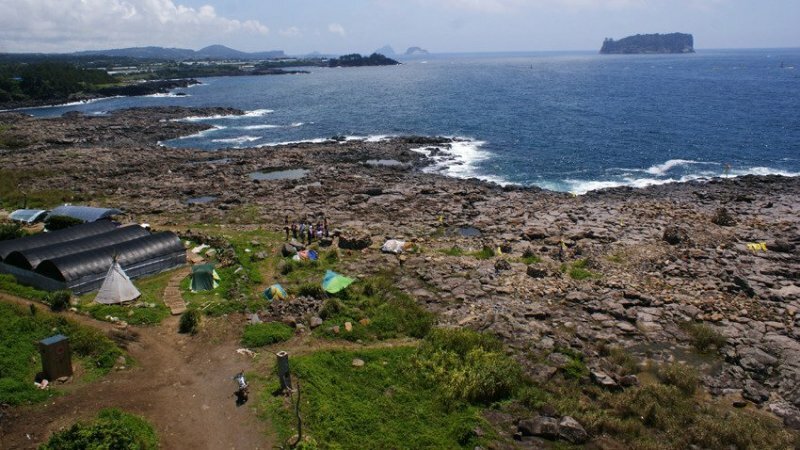 Since 2007, residents of Jeju Island, South Korea, have been risking their lives and their freedom to prevent the construction of a naval base on what many revere as the picturesque island’s most beautiful coastline. This military base is to be home to both U.S. and South Korean naval vessels and a sea-based Aegis ballistic missile defense system. The proposed location of this base is Gangjeong, a small farming and fishing village that has reluctantly become the site of an epic battle for peace. The Jeju Island naval base resistance is, in my opinion, the absolute front line of the struggle for international peace, and is increasingly gaining recognition as such in the minds of my colleagues and some leading scholars. The Gangjeong villagers have been waging a tireless and highly effective fight that stands in stark contrast to what has been a largely unsuccessful international peace movement that all too often lacks focus, unity and realistic goals. Looking back over our collective history of non-proliferation and disarmament efforts, the initiation of the Intermediate Nuclear Forces Treaty (INF) was the last measurable success in the face of U.S. militarism. Since then, U.S.-led coalition wars have nearly been the constant. In addition, global military spending has increased dramatically—not missing a beat despite widespread budgetary cuts and even going up as warfare costs shrink due to the increasing replacement of larger more expensive weapons platforms with unmanned systems. 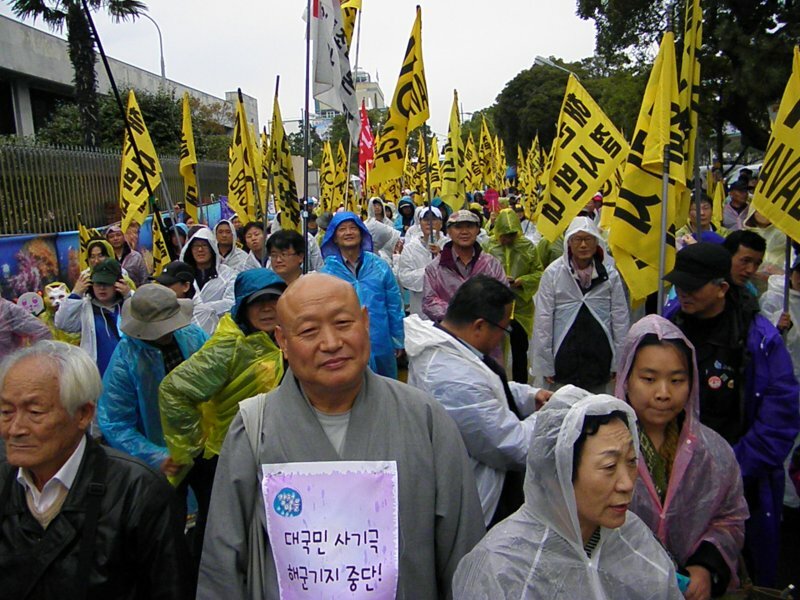 For international peace activists, the Save Jeju Island campaign is what many have been waiting for: An entirely winnable cause for peace with significant international implications. 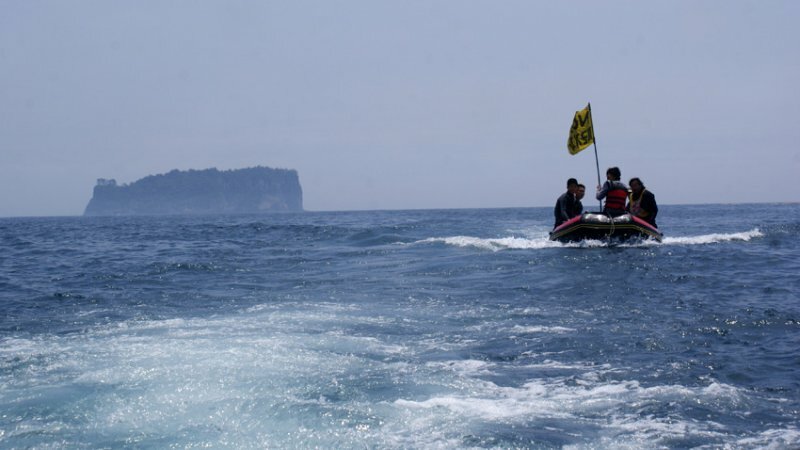 The Jeju Island naval base project is not only highly symbolic, but also quite dire in its potential impact on global security. The planned Jeju naval base facility would have a capacity for two submarines, 20 large destroyers and up to two aircraft carriers. Its purpose, as stated by both South Korean and U.S. military officials, is to project force towards China. Many experts believe that the location of the base will provide a forward operating installation in the event of a military conflict between the U.S. and China. The Aegis ballistic missile defense system will also be based at the Jeju Island base, among the largest naval installations in the region if completed. This Aegis BMD platform is a small component of a much larger US strategy to contain China – at the expense of South Korea. If the base is completed Jeju Island is destined for destruction, as tensions escalate between the world’s two economic superpowers. War hawks in the US are not shy about stating that an eventual war between China and the US is possible. I am completely confident that this base project can be defeated. A victory in Gangjeong village could be the first shot across the bow of the military industrial complex. A Gangjeong victory could serve as a model that could be scaled up and applied to the next fight for peace. So, what needs to be done and what are the challenges to achieve this? First, I would like to provide you with a short overview of where we stand in Gangjeong village at this very moment from what I have observed firsthand over the past few months in my capacity as the global outreach coordinator for this campaign. 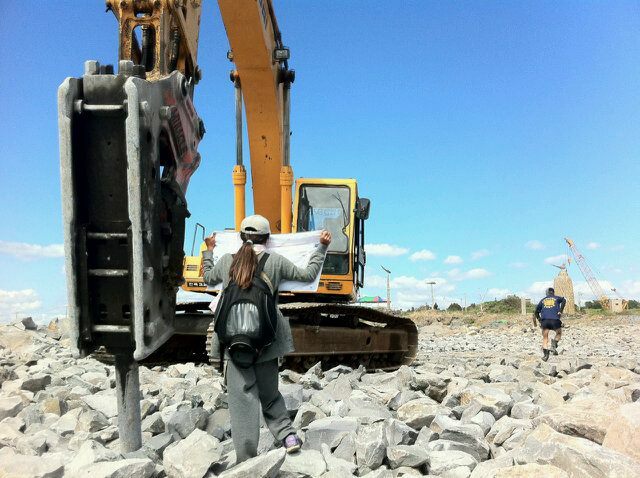 I have also spent five weeks working hand in hand with activists on the ground on Jeju Island. To simply say this non-violent resistance is an inspiration would be a grand understatement. 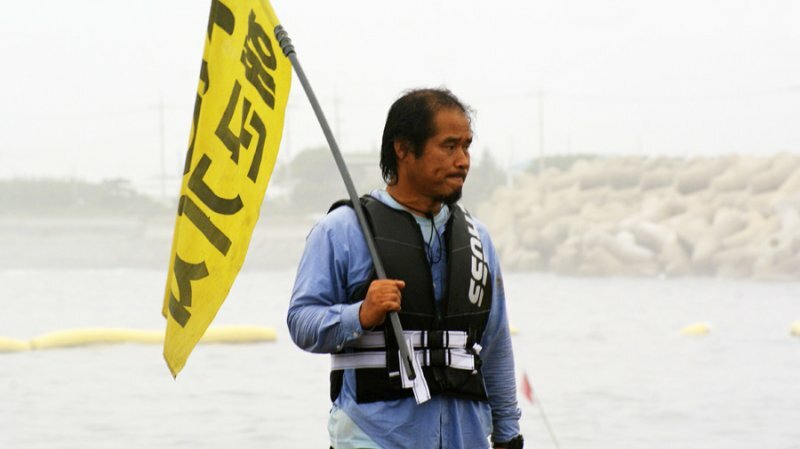 The villagers are now into their fifth year of fighting to halt construction of the naval base, and at this point there can be no doubt that they are at the most critical juncture of that fight. The peace activists and residents are waging a 24-hour struggle for peace. 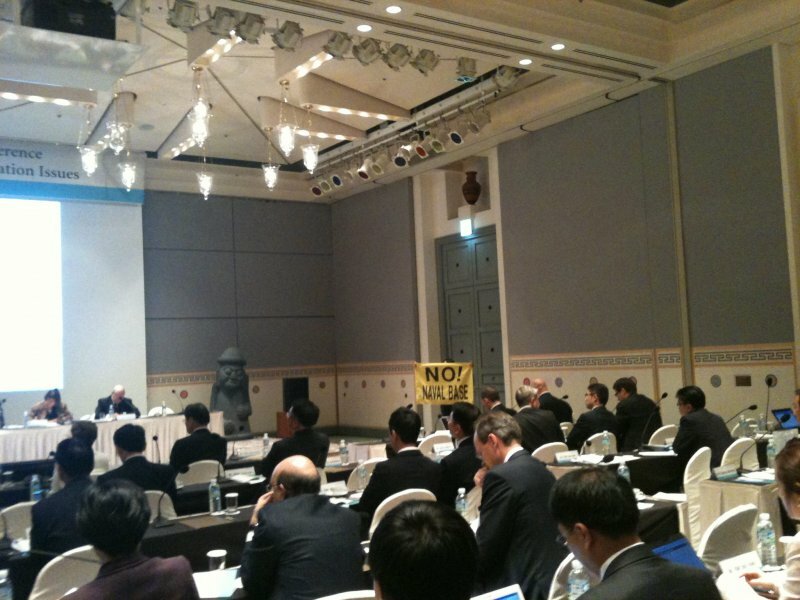 Each day in Gangjeong they organize events that are worthy of international media attention. 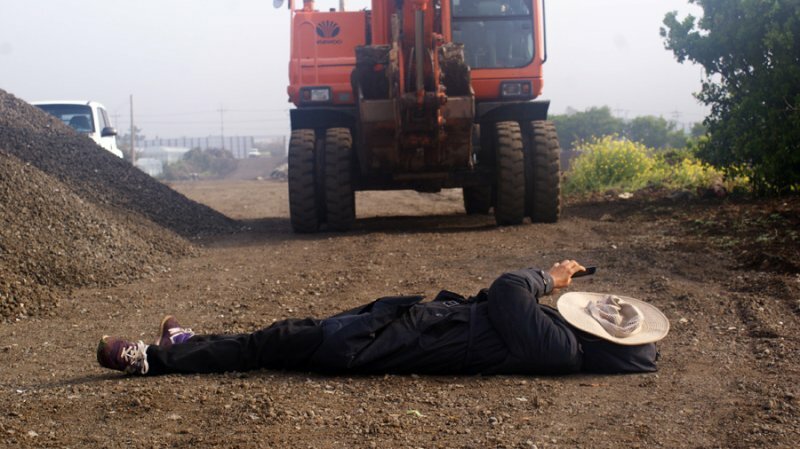 However, because of the remoteness of the village and language/cultural barriers with international activists and media, for the first four and a half years their efforts remained in what I refer to as the “Jeju bubble.” For example, colleagues of mine in the United States who are known as Korea security and nuclear experts were completely unaware of what was taking place. In fact some did not even know where Jeju Island was located. Today that has changed and we have, through the hard work of many people, placed the Save Jeju Island campaign in media outlets around the world, such as Al Jazeera, MSNBC, PressTV, The Washington Times and the New York Times. We in the peace community are very fortunate that the villagers have a highly sound and logical argument against the base that stands on documented evidence and scientific fact across multiple disciplines. This alone has removed many challenges that plague some peace campaigns. We are winning over new supporters from all areas of the political spectrum daily around the world, though this process relies heavily on consistent international press coverage and outreach efforts. When the entire argument is laid out I have found that even the most hawkish of my colleagues, including current and former military personnel, are disturbed by the location of the base. As an example, even if an individual is in favour of increasing the U.S. military presence in the Asia-Pacific region, the environmental argument against the base is compelling enough to outweigh the benefits. The case against the naval base is divided into four core aspects: (1) International Security (2) Human Rights (3) Environmental/Cultural (4) Legal. These categories provide abundant opportunities for outreach. Located approximately 300 miles from China, the simple presence of the Jeju Island naval base alone will undermine China’s national security and strategic nuclear deterrent. This ability to undermine grows exponentially when we take into consideration the presence of Aegis destroyers outfitted with a missile defense platform. Currently up to three Aegis Destroyers will be present on the base site. That number could rise to six or even higher with occasional visits of U.S. Aegis ships that should be expected. Many world-renowned experts and missile defence analysts have stated that this base is completely ineffective at addressing the true threat to South Korean security—the missile threat from North Korea, since the Aegis system cannot target DPRK ballistic missiles as a result of their flight trajectory and altitude. The location of the base does, on the other hand, serve as a prime location for the intercept of DF-3 and DF-4 ballistic missiles located in South East China that could in theory be used to target Japan. The base is also expected to serve as a temporary port for U.S. submarines and carriers such as the USS George Washington, which has been involved in war-gaming exercises with the ROKN. It is especially concerning when the depth of the planned Gangjeong port is studied, which suggests that it is more than adequate to host nuclear armed U.S. Trident submarines (SSBN). It is not far-fetched to imagine a Cuban Missile-style crisis. The temporary basing of an SSBN carrying nuclear weapons during a time of extreme tension between the U.S. and China would provide an unparalleled first-strike ability. For this and many reasons China is and will continue to be increasingly concerned about the Jeju Island naval base. Simply put, this military venture stands to benefit U.S. national and economic security policy and not that of South Korea. The base will create far more problems than it will solve. Contrary to some misconceptions in the press South Korea and China enjoy positive relations. In fact, China is South Korea’s number one trading partner. I think we all know who stands to benefit economically from a breakdown in ROK-PRC relations. That same country that just signed a Free Trade Agreement with South Korea: the United States. 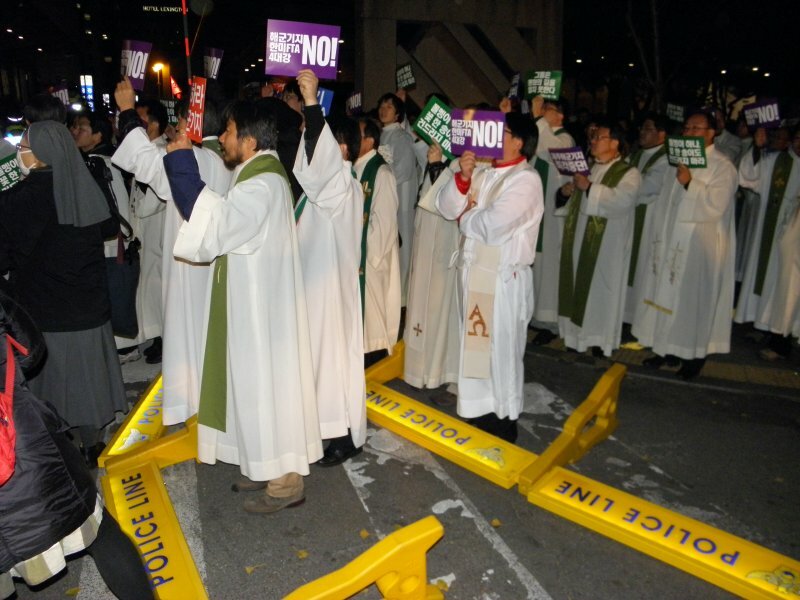 The second dimension to the Jeju base argument is human rights. 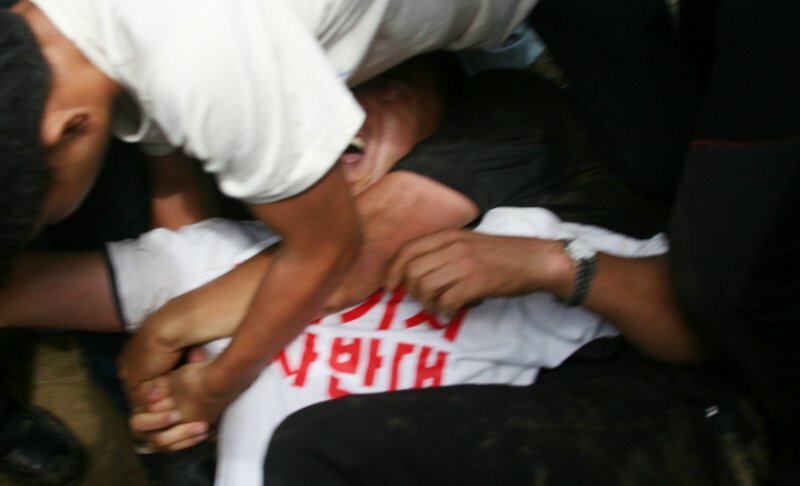 Gangjeong villagers are being targeted by police for their political beliefs. 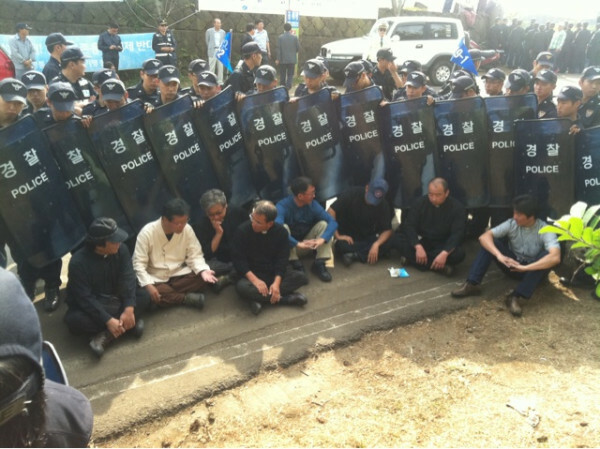 The police have fined, imprisoned and held innocent villagers for legally standing up for peace in Gangjeong village. The tool for their oppression is referred to as ‘Article 314’, a law commonly used for pressuring trade unions and cracking down on public assembly. The police even monitor Twitter to find people who post the most and then forcefully investigate them. At the same time IP addresses that trace back to the security services have been seen perusing the campaign’s primary English language website, looking though videos and pictures from peace rallies. This is to be expected but is unacceptable in light of a recent wave of the police calling innocent citizens in for questioning by detectives. Recently 200 villagers were called in for questioning. These people have committed no crime and are not affiliated with any criminal enterprises. If these targeted villagers and activists do not arrive for questioning they are hit with crushing fines and can even be arrested. This is just the tip of the iceberg. At the moment we are presenting this evidence to leading international human rights organisations. Additional examples include the names of 70 peace activists and four peace organisations being posted on a large sign in the village, stating the penalties they face if they cross the line at the naval base site. These people have committed no crime and this is seen as a form of intimidation. Recently three men were released from prison after being held without bail for 92 days. One of them was the democratically-elected mayor of the village. 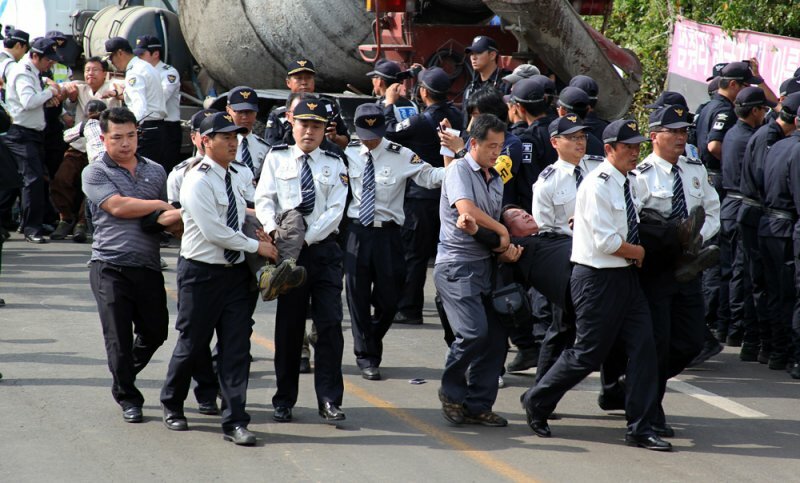 They are just three in a long line of villagers and activists who have been held without bail for more than one month. A female journalist was also recently arrested, harrassed and accused by police of being a communist. These are just samples and the list goes on and on. The third argument includes a combination of cultural and environmental sensitivities – with three key focal points. 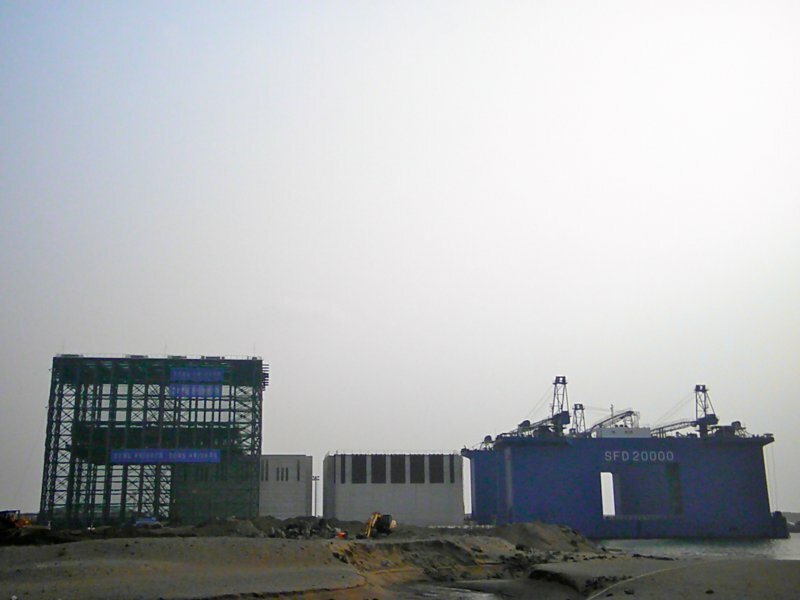 Focal point one is the indisputable archaeological significance of the Gangjeong naval base construction site. 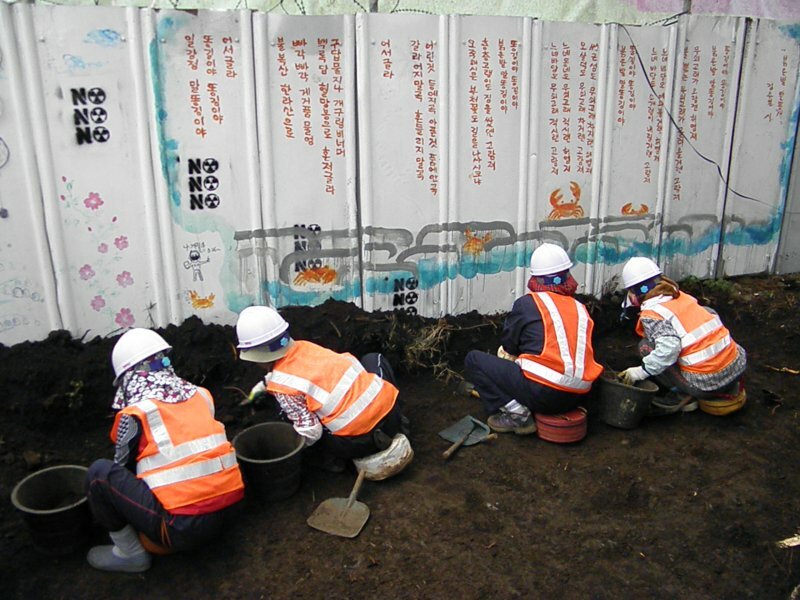 Historic relics from the Bronze Age to the Joseon Dynasty are scattered widely across the base site and have been recently discovered along with human remains. Despite these significant findings the lead contractors on the project, Daelim and Samsung, are recklessly ploughing forward. At this moment the Navy is racing as fast as possible to build the base before more relics are discovered—demolishing what may be land parcels that are culturally and historically significant. The second focal point in this category lies in the past and its cultural significance. The last time a military base was located on Jeju Island, more than 30,000 people were killed in a genocide known as Sasam, killed by the South Korean government under US military rule. It is absolutely certain that this naval base will deliver more trauma, pain and death to the people in Jeju at some point in the future. Maybe not in one year, many not in ten years, but that day will come if Jeju is militarised. 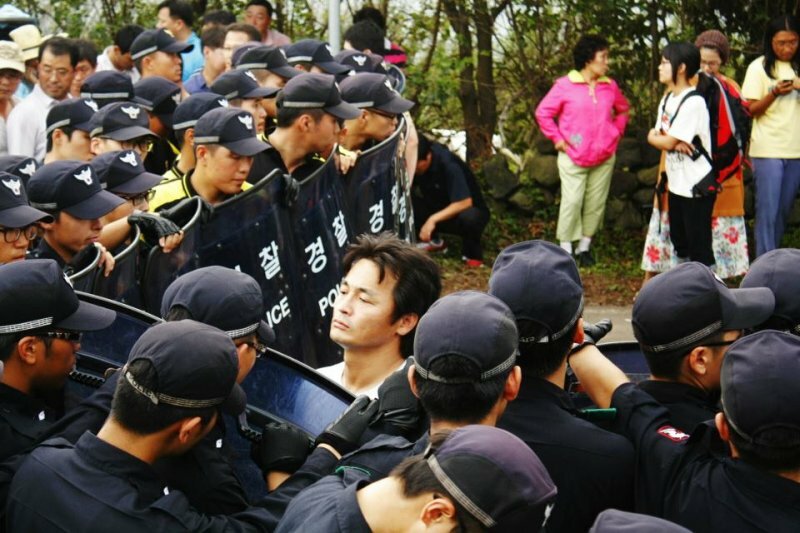 With the trauma that the senior members of Jeju endured, the idea of militarising the island should be temporarily suspended and a vote held. The people of Jeju have the right to choose their destiny and not be subjected to a massive military presence once again. For far too long Korea has suffered as a result of other nations’ pursuits and wars. 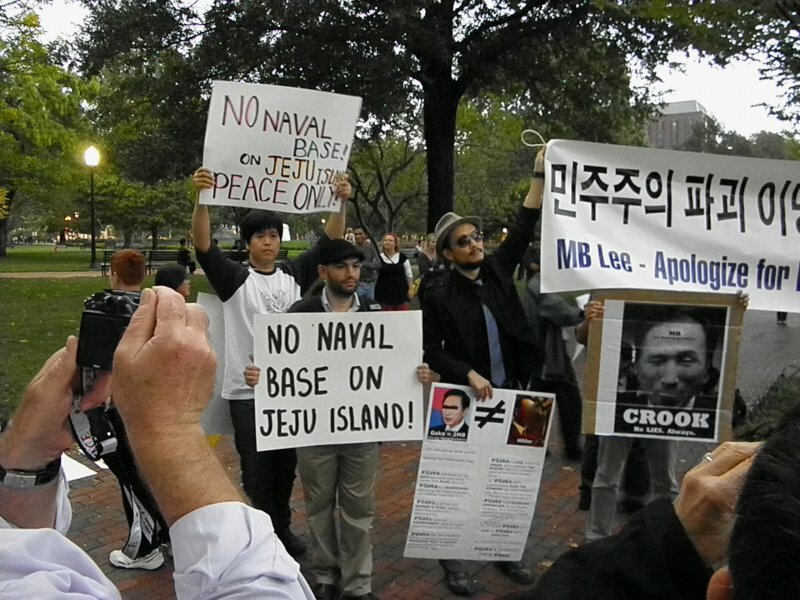 US ships docking at the Jeju naval base will encourage a return to those dark days. 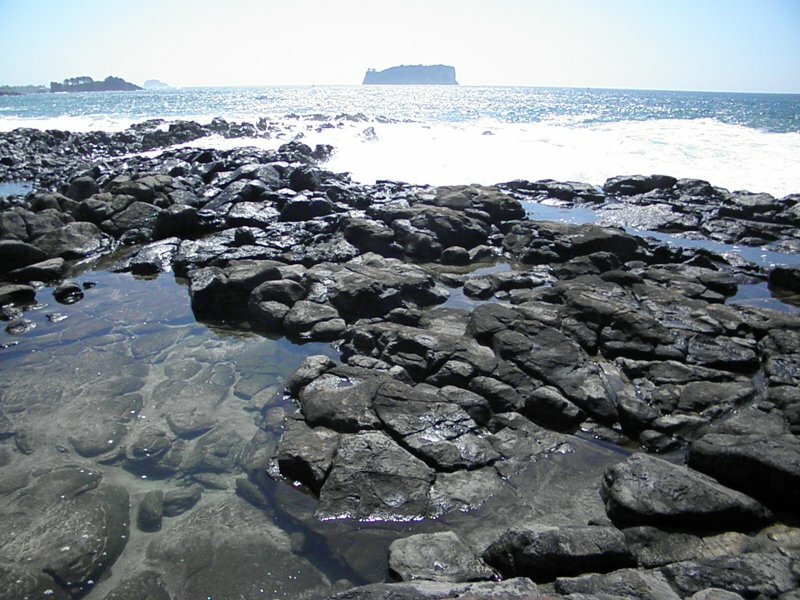 The third prong is the many environmental and cultural designations that Jeju enjoys. Those who have traveled to the Island know that it is one of the more idyllic locations on the planet. Jeju is also internationally recognized as the Island of World Peace—a distinction that seems impossible to maintain with a U.S. carrier and 20 destroyers sitting in port for any duration of time. Even the nearest large city to the base, Seogwipo, is known officially as the City of Peace and Hope. The island also boasts three UNESCO World Natural Heritage Sites, a designation that must be reviewed at timed intervals by an official committee. The nearest UNESCO site to the base is approximately two kilometres away. There are also nine UNESCO Geoparks on the island. Compromising the status of any of these could be an economic hit to an island deeply reliant on tourism. The island is also known as a Global Biosphere Reserve because of the diversity of its plants and animals. 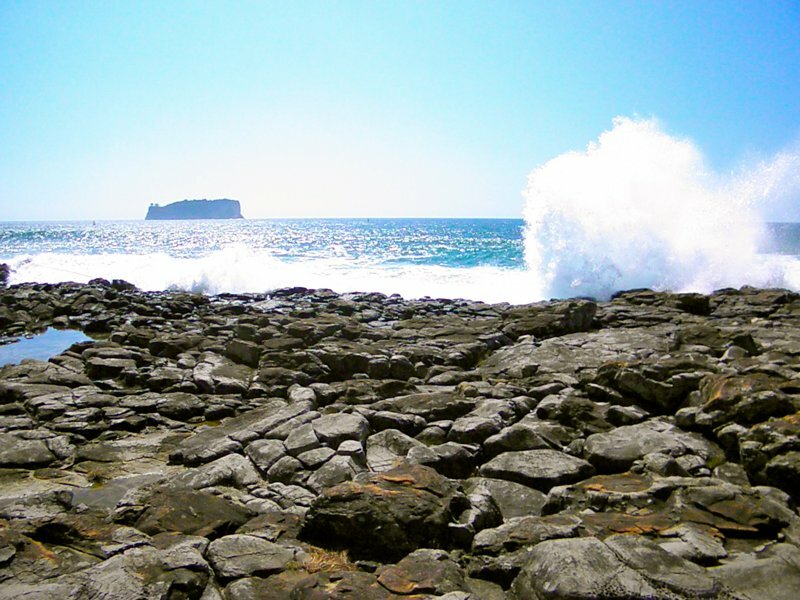 Most recently Jeju was declared one of seven new Wonders of Nature in an international competition. 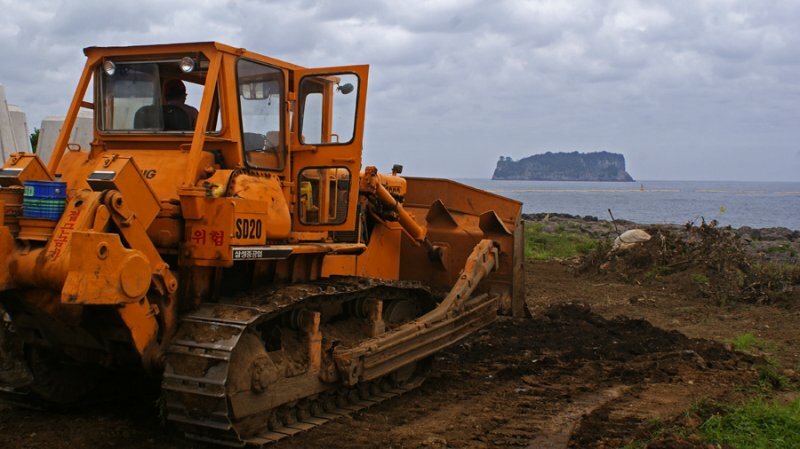 One of the lead contractors on the project, Samsung, and the South Korean navy are at this moment dredging soft coral beds to make way for the base. 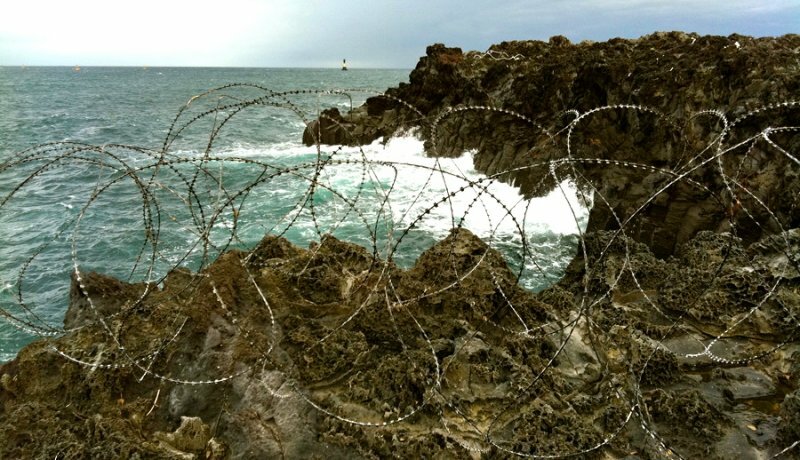 Both parties ignorantly claim that after this “environmentally-friendly” military base is completed that the coral can be “reconstituted” and endangered species of which there are many on this particular coastline can be relocated safely. Moreover, the coastline where the base is being constructed is one of the only locations on all of Jeju Island that has a natural spring with crystal clear water. The preservation of this environment would be impossible with such a massive military facility. What few people know is that this entire area was designated an “Absolute Preservation Zone” meaning that it was protected. The military simply ignored that designation. The fourth component is the legal dimension—specifically referring to the process that led to the approval of the base construction in the first place. At face value the base construction approval process seems to have been approved by a democratic vote. This is the claim made by the South Korean military on a regular basis. The truth is that only 87 people, some of whom were bribed, out of 1800 residents had an opportunity to cast a vote on this matter. The remaining 1,700 in the village had no voice and no say in the discussion, contrary to what is claimed by the military. There was no paper trail to provide transparency into this sham vote, because the votes were not documented on paper, but were cast by applause—yes, by clapping. What is most disturbing is that a local media outlet announced that the base construction project was approved before the voting process was even completed. When the village held their own re-vote, which fairly included the entire community, 94 percent of all villagers opposed the military base — yet the government and military refused to recognise the results. 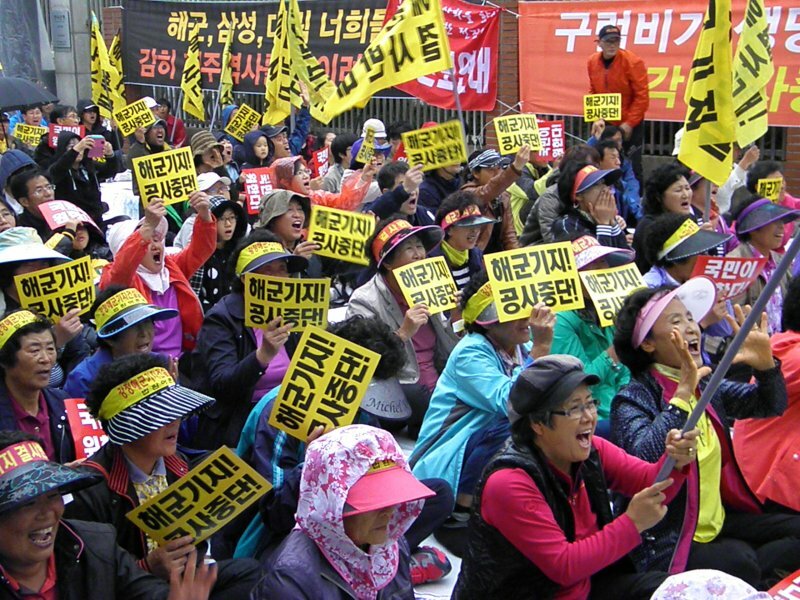 Above all, the people of Gangjeong demand a new fair referendum that ensures all people in the village have a voice. This is not an extreme or radical demand. A new referendum will end the protests and this five-year battle that has disrupted a community, left residents in prison and compromised the local economy. Just last week the democratically-elected Mayor of Gangjeong who oversaw the new 94 percent vote was recently released from prison for standing against these affronts to democracy. He was held without bail for more than three months. Above all the lack of transparency and abundance illegalities are mounting, yet the project continues. Recently the provincial government called on the military to halt the demolition of the coast, yet the military regularly operates above the provincial government so there is simply nothing stopping this project. The military is running the show in Korea, above the people, above the provincial government. These four dimensions, the arguments contained within them and even more key points that I have not listed present an unprecedented opportunity for the international NGO community to assist the Gangjeong villagers in this noble fight. This is a very well targeted and refined campaign, rooted in facts. This fight is entirely winnable. So why is construction still continuing? Why has victory yet to be seen? There are critical hurdles that offer an answer as to why we have not won this fight already. 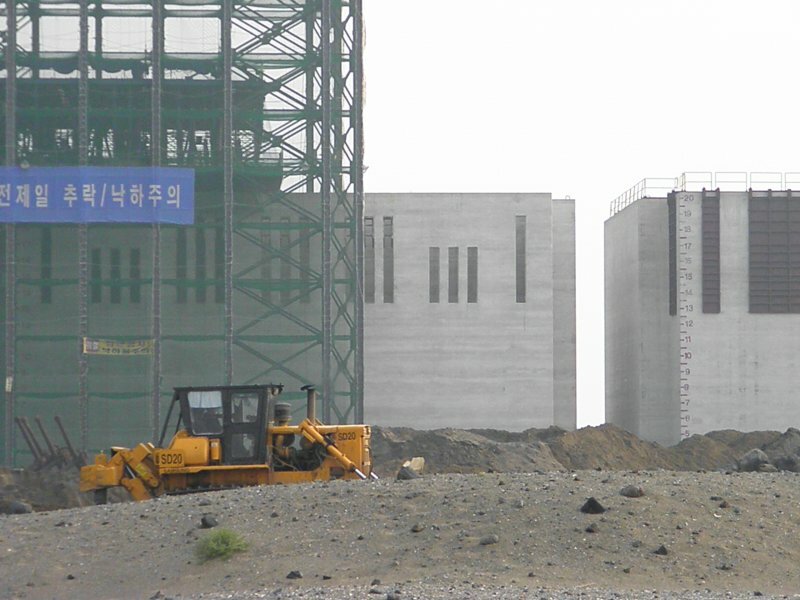 Firstly, the opinion of the Gangjeong people on this matter means very little, if anything, to the key government and military officials who can stop this base project. Especially with so few people on the Korean mainland involved. This fight is taking place behind a curtain. 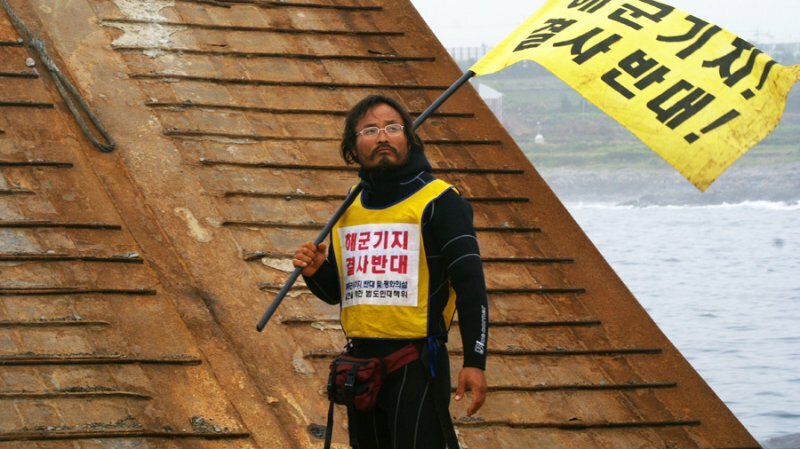 If not for the those few in the Korean civil society groups that are devotedly assisting Gangjeong villagers, a handful of non-profits in the international community, religious leaders in Korea and brave media outlets, few people outside of Jeju Island would even know that this fight is taking place. In the “Jeju bubble” the military is running the show, and illegalities can go unnoticed and therefore unquestioned. Brutal crackdowns, illegal interrogations, arrests and incarcerations are just a few examples of what is taking place under the cover of darkness. One does not have to look far to see the frustration that people have with the political process in South Korea. The important victory of Park Won Soon, who belongs to no major political party, in the race for Mayor of Seoul reflects this. 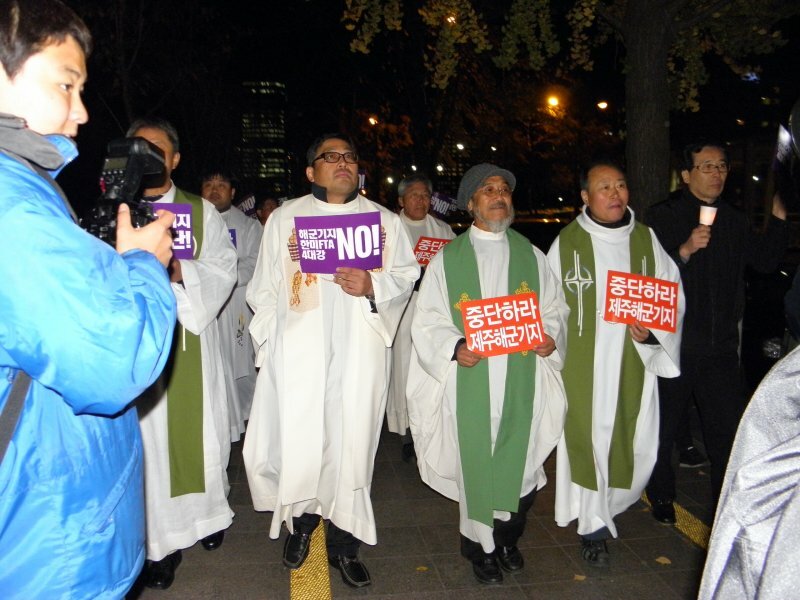 As long as NGOs, human rights, religious and civil society groups do not redouble their efforts to call attention to what is happening in Gangjeong then there can be no accountability. On the bright side Korea is changing politically and it is happening very fast. 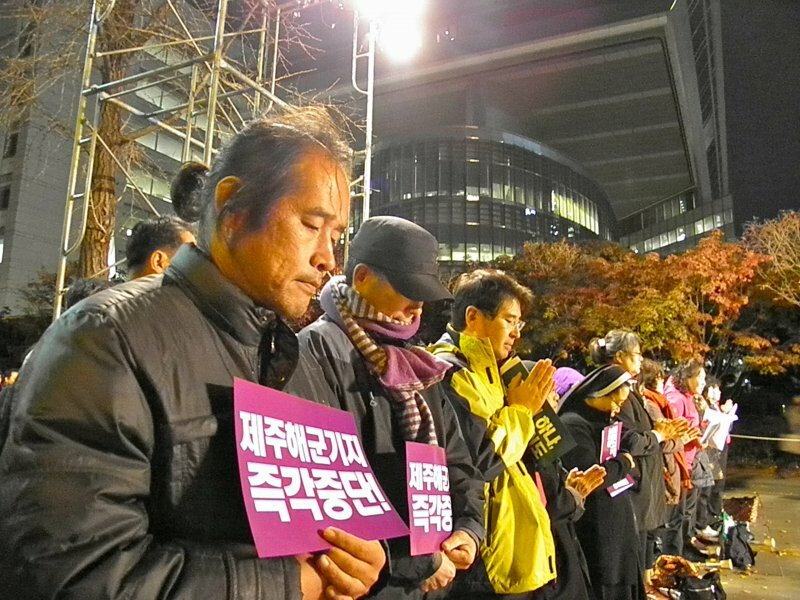 Trends surrounding the victory of Park Won-soon stand to continue and significantly change the balance of power in Korean politics, by way of the Korean Parliamentary elections that will be held in April 2012. Those trends I speak of can be best described as follows: What we witnessed during the election of President of Barack Obama campaign in the US is about to take place in Korea, in the country’s very first social networking sites (SNS)/internet driven-race for the presidency in December of 2012. The Seoul mayor’s race was a beta-test of that web-based campaign model. It is my opinion and even that of two Korean National Assembly members that I spoke with in Seoul that the hope of defeating the naval base project rests on the upcoming parliamentary election. The Lee Myung-Bak GNP/Hannara-led government is not listening to the people of Korea: No riot, protest or news article will change their stubborn ways. Change will only come with a new government. With an opposition majority in the parliament, a victory against militarisation becomes far more possible than in this current state. 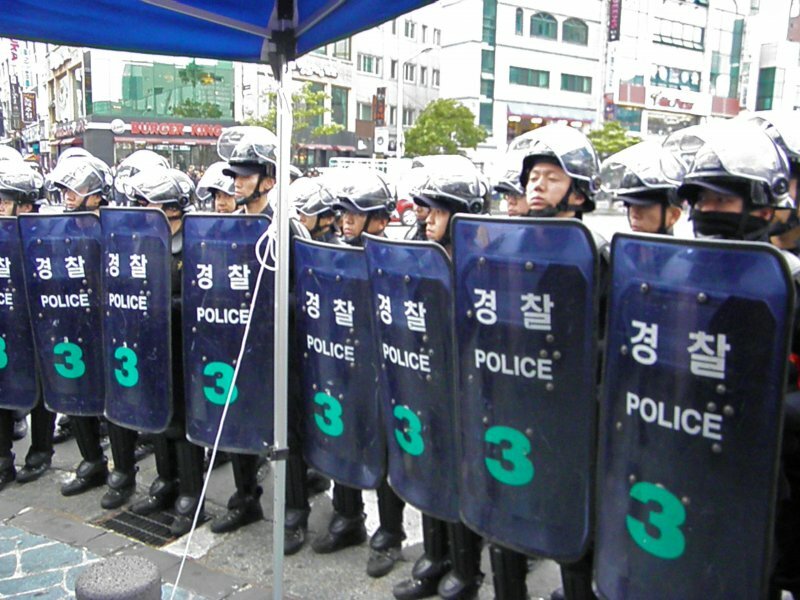 Additional political trends in Korea reflects a state of unrest that is being seen internationally from the Euro-zone to Zuccoti Park in the New York City. In Korea, running in parallel to the conventional political climate, a spate of popular uprisings has taken place. 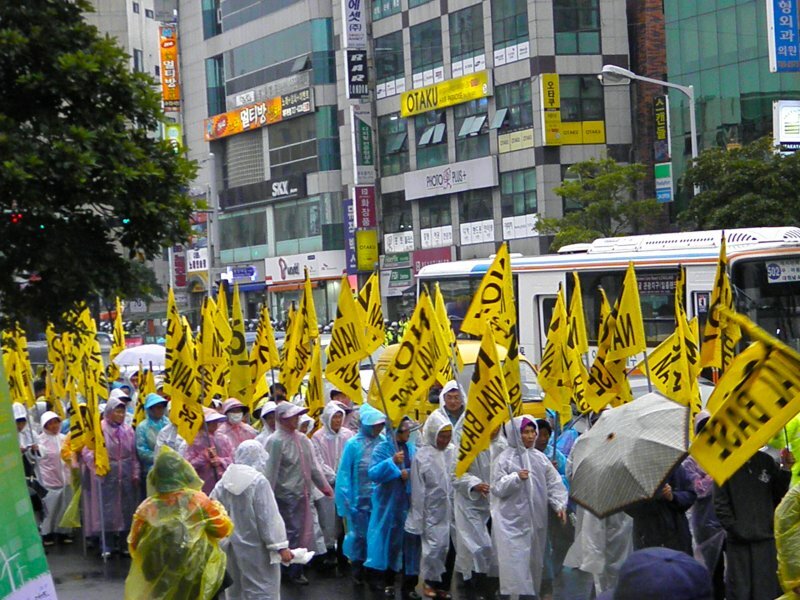 Most notably are the protests against the South Korea-United States Free Trade Agreement (KORUS-FTA). A process of convergence is currently underway between the FTA rallies and the Gangjeong resistance. The Jeju Island naval base issue has the potential to become a leading political hot button topic – much more than it is now – if in the coming weeks it is adopted by political candidates fighting for national assembly seats. This will greatly accelerate the public education effect in Korea and in the region. As I have said, the people of Gangjeong are waging an incredible campaign and it is being executed quite flawlessly. They are delivering the tools of victory to the international NGO community on a silver platter—an NGO community that has gone too long without a victory. Imagine the Gangjeong struggle as a relay race where the first group of runners is the Gangjeong people. They are a powerful force in the race against the naval project and US militarisation, but when they complete their leg of the race and go to hand off the baton, there are not enough people to receive it. 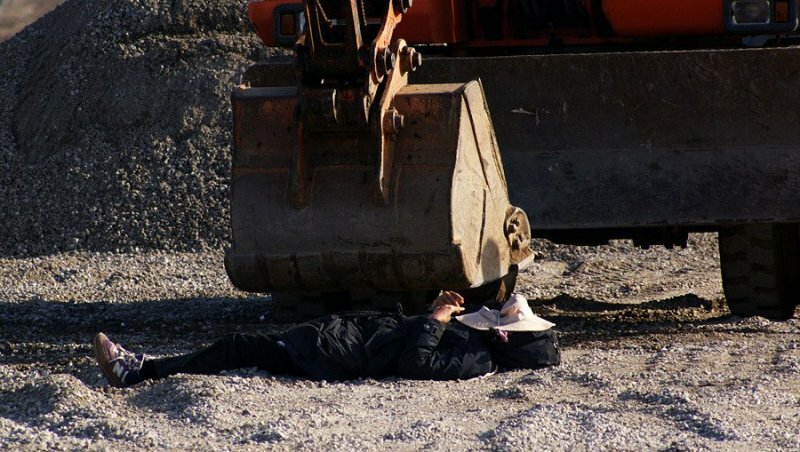 The energy of the Gangjeong people is being squandered. We must plead with our colleagues around the world to rise up and join the Jeju naval base resistance, arm and arm in this struggle. But where do we go once we have received the baton? Where to we run to? The answer is the Internet. The same place that delivered victory to Park Won Soon, the same outlet that will deliver the parliamentary elections to opposition democrats and the same place that will deliver an opposition president to the people of Korea. SNS and the web is changing the world, it is just now beginning to change Korea. Moreover, in the fight against the naval base, the government will not respond to the people on Jeju, but they will respond to the web, they will respond to international media coverage and they will respond to international pressure. It is my hope that the web will shine light on the injustices being placed upon the Island of World Peace. If you look to the recent examples of popular uprisings around the world in Tunisia, Egypt, Libya and Syria, the people alone cannot be victorious against a government that is deaf to their will and thumbs its nose at the democratic process. It was not until people around the world triggered a global movement on the web that milestones were reached and victory achieved. 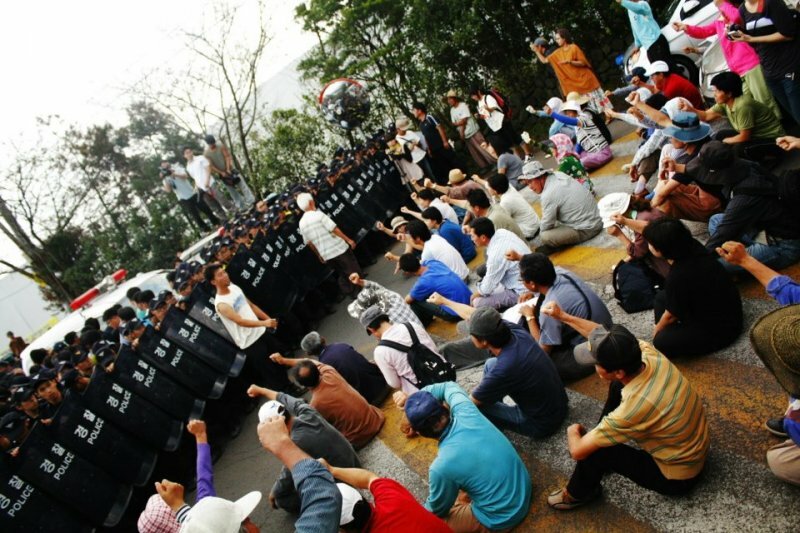 Now of course, Jeju is not as big as the Tunisian uprising or what we witnessed in Egypt — and that is why we can win. This is our chance to set into motion a global movement against militarisation. Jeju will be the first in a series of victories. We cannot squander this opportunity. Just to be picky: the opening quote from Noam Chomsky was actually from an article he coauthored with Hoey in September 2011. Here one might note that the failure of American anti-nuclear activism during the 1980s were caused in part by the meddling of renowned arms control expert Dr. Randall Forsberg: an issue that has been documented at length in Frances McCrea and Gerald Markle’s excellent book Minutes to Midnight: Nuclear Weapons Protest in America (Sage, 1989). (For a summary of this argument see http://www.swans.com/library/art15/barker31.html ) Thus it is more than a little concerning that Hoey (who has been an advisor to the Jiju campaign since June 2011) previously spent 3.5 years working under the guidance of Dr Forsberg from 2003 until late 2006. One can only hope that he learnt the appropriate lessons from this experience in liberal peace activism.